San Bernardino, California (July 9, 2018) – To help smokers overcome nicotine addiction, Stater Bros. Super Rx Pharmacies will provide NRT (Nicotine Replacement Therapy) to qualifying individuals. NRT can be provided without a physician’s prescription due to California law (Senate Bill 493) which includes a protocol that allows pharmacists to prescribe NRT just as physicians do. NRT is covered by most insurance and a prescription can be coordinated at one of the 24 local Stater Bros. Super Rx Pharmacies. 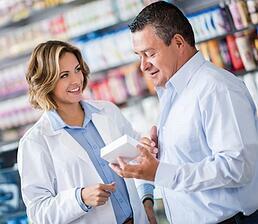 For a list of Stater Bros. Super Rx Pharmacy locations, visit staterbros.com. In collaboration with the California Smokers’ Helpline, Stater Bros. Pharmacists will also assist customers by providing referrals to the free, evidence-based smoking cessation services available from the California Smokers’ Helpline. Upon referral, the California Smokers’ Helpline will call patients to offer free telephone counseling, self-help materials, and referral to local cessation resources. Services are available in multiple languages including English and Spanish. “We are pleased to work in collaboration with California Smokers Helpline to provide assistance to individuals seeking to overcome nicotine addiction,” stated Pete Van Helden, Stater Bros. CEO. “The California Smokers’ Helpline applauds the efforts of Stater Bros. Super Rx Pharmacies to increase patient access to nicotine replacement therapy, an evidence-based strategy for helping smokers quit,” stated Shu-Hong Zhu, Ph.D., Director of the Helpline and Professor of Family Medicine and Public Health at the University of California, San Diego. Stater Bros. Super Rx Pharmacy is committed to offering healthy living programs for its customers, such as FREE prenatal vitamins to expectant mothers during the upcoming month of May which is “Pregnancy Awareness Month”. Recently, Stater Bros. Super Rx Pharmacies improved their $4/$10 generic program by offering additional tiers. These tiers consist of an $8 and $12 offering and bring over 350 commonly prescribed medications to the program in order to add value for their customers. The California Smokers’ Helpline (1-800-NO-BUTTS) is a free statewide quit smoking service, operated by the University of California San Diego and proven in clinical trials to double a smoker’s chance of success. The Helpline offers self-help materials, referral to local programs, and one-on-one, telephone counseling in multiple languages including English, Spanish, Cantonese, Mandarin, Korean, and Vietnamese. Specialized services are also available for teens, pregnant women, and tobacco chewers as well as for friends and family members of tobacco users. New services include online chat, a texting program, and a mobile app. For more information, visit www.nobutts.org. Stater Bros. was founded in 1936 in Yucaipa, California, and has grown steadily through the years to become the largest privately owned Supermarket Chain in Southern California and the largest private employer in both San Bernardino County and Riverside County. The Company currently operates 171 Supermarkets, and there are approximately 18,000 members of the Stater Bros. Supermarket Family. Since 2008, Stater Bros. and Stater Bros. Charities have contributed more than $80 million in food and funds to local Southern California communities. For more information, visit staterbros.com.